Ecuadorian artisans hand-carve “vegetable ivory” tagua nuts into bunny rabbit pendants. 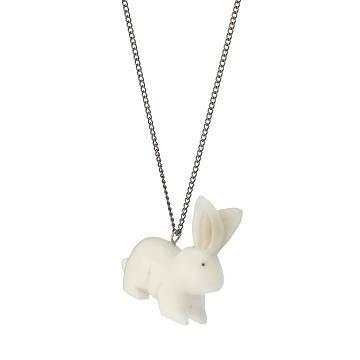 This hand-carved tagua necklace is one small hop for bunnies, and a giant leap for rabbit kind. Artisans in Ecuador hand-select a piece of "vegetable ivory" that naturally resembles the finished bunny. They carve, sand, and polish it smooth 'til the cute cottontail is ready to jump into your life. 32" oxidized stainless steel chain. Handmade in Ecuador. 1.5" L x 1.5" W x 5/8" H Chain: 35"